What I wouldn’t give to be in Wrigleyville tonight. Maybe Boystown after, but Wrigleyville for sure. They’re going crazy there tonight, and in both cases, they’re all about the Cubs, perhaps in different ways. First up, did Addison Russell know something before Game 6? Kid’s got moves. Six RBIs, including that ridiculous grand slam in the 3rd inning. This one was over early, but we have to give some love to a pair of JockPop favorites tonight. The first: newly-minted Stouffer’s frozen dinner spokes-stud Kris Bryant, who went 4-for-5 with an early homer. Stare into his eyes with me, won’t you? And while the Indians suddenly find themselves with their backs against the wall and facing a winner-take-all game at home, Jason Kipnis had a hell of a game, with a solo shot against Jake Arrieta and his amazing beard in the 5th. 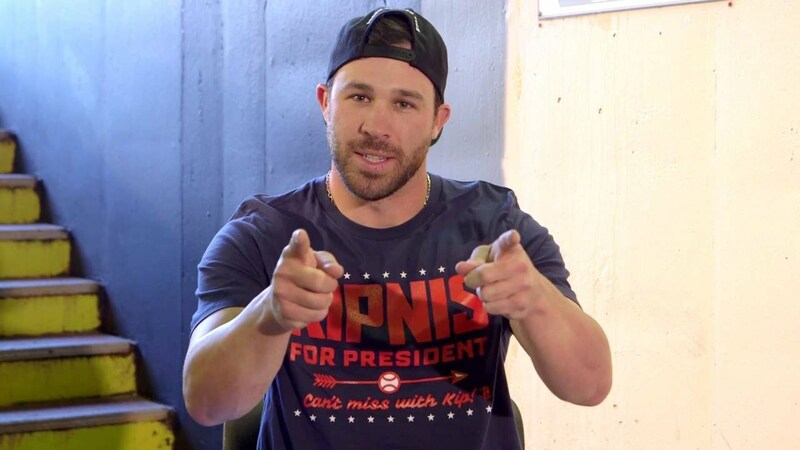 Kipnis, a Cubs fan, is also apparently running some sort of campaign for President — which we’re totally on board with. So tomorrow night is the night these guys have worked for their entire lives. It’s going to be incredible to watch. History will be made. One of these teams will break a long title drought. The question is, who will it be? Who wins Game 7? Cubs? Indians? Let us know.